As a reminder, please RSVP yes or no to these events so we know you've made a decision to attend or not to attend. Thank you!! Pictures from Florida Sea Base Scuba Diving Trip (that was talked about at the Court of Honor) and other activities the Troop has done can be found "Photo Gallery" under the Menu. Does your son or spouse also want to get Troop emails and access to the website? 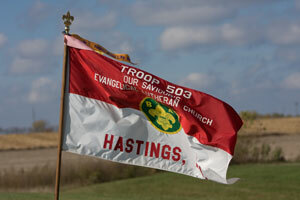 If so, please contact us (Eric Kennedy) via webmaster@hastingstroop503.org and we'll get them added. Please send any other helpful contact information (e.g., phone numbers) at the same time. Thank you! Need to contact a leader? The Troop is sending two groups to Philmont the summer of 2019. There's space available in both treks if a scout and/or a parent is interested in joining. See more information in these calendar entries: June 2019 Trek and July 2019 Trek. Contact Eric Kennedy with any questions.